The Tamagotchi v4 was the first version was centered around jobs. The job you get depends on how well you raise your tama. There are 18 different v4 designs, including the special glow-in-the-dark v4 design, making it 19. Pausing Your v4: Press A and B together. Marrying via Matchmaker: The matchmaker will show up and present you with a partner that you can marry. If you marry him/her, you will see fireworks on the screen. Your tama is now married! You will have a baby that your tama will take care of, unless they're both sick. 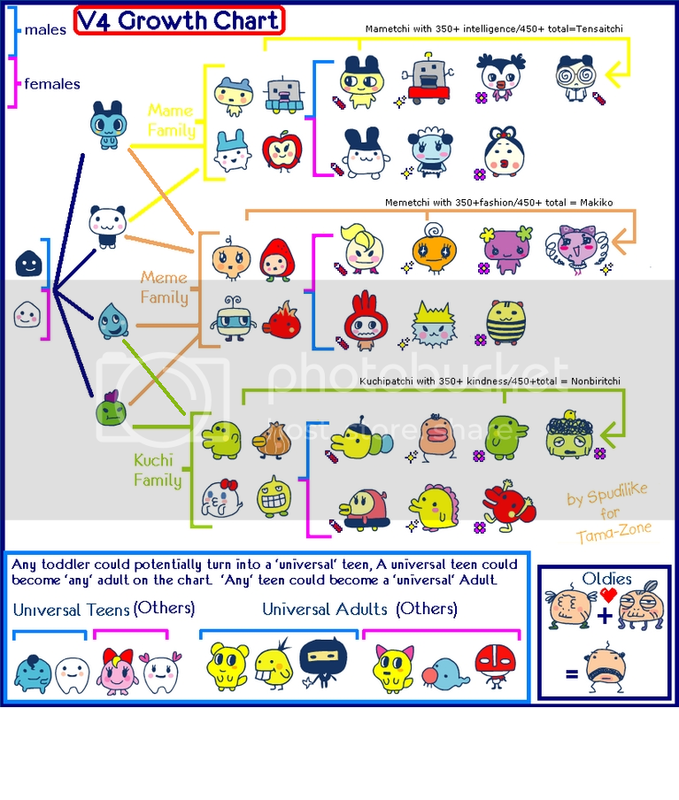 After 24 hours, your tama will go back to Tamagotchi Planet and leave you with the baby. You're now in the next generation! Jump Rope: Jump over the jump rope without getting caught in the rope. Use either the A Button, B Button, or C Button to jump. Be aware that the speed of the rope will increase. If you make it to jump 30, you win! Mimic: You must have the same pose as the character on the right. After the character does its pose, your tama will do a series of poses. Press any button to stop your tama in the same position as the other character. You must complete four rounds to win. Shape: Match the shapes before they get to the bottom of the screen. When you see a shape fall, use the B Button to scroll through the different shapes at the bottom and match it to the falling shape. As soon as you match it, send it up to the falling shape by using the A Button to send it to the left of the line, and the C Button to send it to the right of the line. Match 30 shapes to win. Dance: Match your tama's dance to the three lights that flash at the top of the screen. Left light: A Button Middle light: B Button Right light: C Button. If two lights come on, press the corresponding buttons at the same time. A whistle will go off every time the lights change. The lights might not change after the whistle, so you have to pay attention! You win if you get through 6 rounds. Flag: Match the flags appearing above your tama with the ones in its hands. Black flag: A Button White flag: C Button. If both flags appear, press both buttons at once. It doesn't matter which side the flags appear on. Just press the corresponding buttons. also, fake flags appear. You can recognize them by the irregular appearance and the awkward sound. 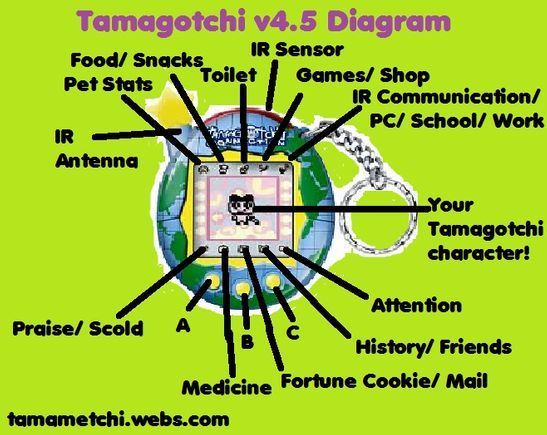 The Tamagotchi v4.5 was a continuation of the Tamagotchi v4. 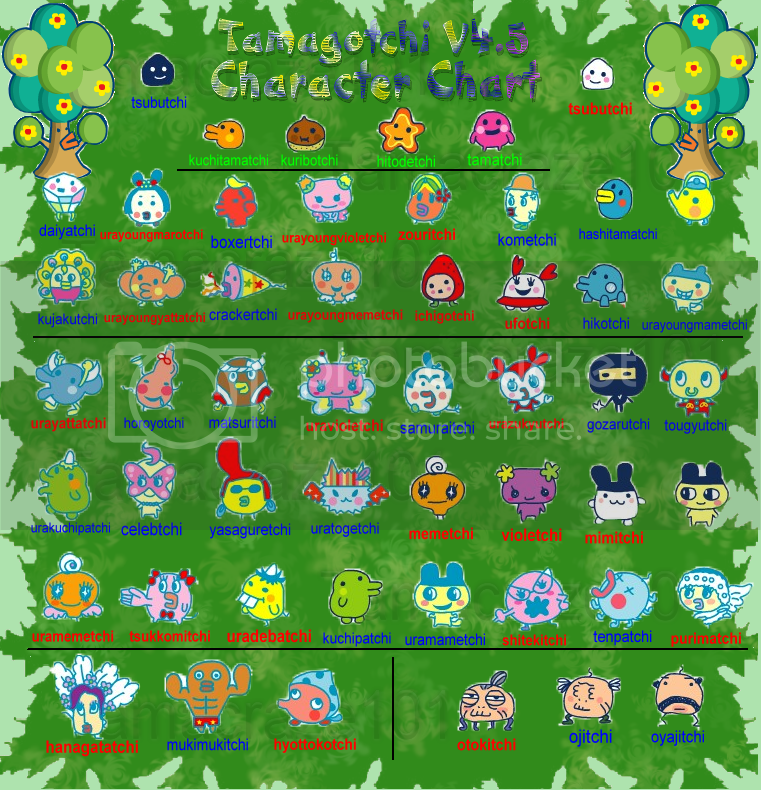 This version had more characters plus some characters from the Ura-Tama, a Tamagotchi toy only released in Japan. Pausing Your v4.5: Press A and B together. Climb: Jump from cloud to cloud by using the B Button. The clouds get faster and faster with every jump. Timing: Jump right before the cloud gets above your tama. Complete 30 jumps to win. Tug Of War: Press B when your strength bar reaches the maximum point. Apple: Collect apples by using the A Button to turn left and the C Button to turn right. Don't let any apple get on the ground! Collect 50 to win. Shapes: Use the A Button, B Button, and C Button to rearrange the shapes at the bottom to match the falling shape pattern. Manhole: Use the A Button, B Button, and C Button to open the holes and let hearts and Gotchi Points in. Do not let the snakes or poop get into the holes or you will lose! v4 and v4.5 toddler and teen characters go to school. When a toddler gets enrolled in school, you can't interact with it. You just watch it. But when a teen goes into elementary school, you can choose the teacher. Mr. Turtle gives you Intelligence points, Mr. Canvas gives you Social points, and Ms. Sunflower gives you Artistic points. Press the A Button to scroll through the teachers and press the B Button to select the teacher. Playing the game is simple. The teacher will place a skill point in a box. Then they get shuffled. Choose which box you think the skill point is in. Get it right and you get the skill point. Get it wrong and you get poop. As you can see, v4 and v4.5 adult characters get jobs! You will be offered a job as soon as you graduate from school. You will get a letter like this: [ ! ]. There's a catch, though! You have to have enough skill points to apply for a certain job. You must get at least 2 O's to get a job. If you get more X's, you will have to try another job. REJECTION! : If you get rejected from one job, you can always try another job. Rejected from them all? Don't worry! You will be given another chance the following day. Remember: You have to have enough skill points to get a certain job. To go to work, go to the heart icon and select "WORK". 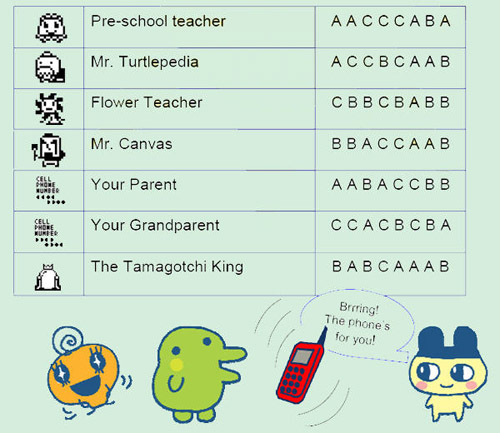 Your Tamagotchi will get paid gotchi points depending on how much it works. You also earn skill points! You will be offered a second job usually after your tama has a baby. Hospital: Catch the falling hearts with your bag. Try to avoid the skulls. If you get to 100, you win! School Teacher: Collect the number of items needed before time runs out! A Button: Choose what you want. B Button: Select item. C Button: Go to different screen. Scientist: A picture will be shown of one out of three items. A Button: First item. B Button: Second item. C Button: Third item. Quickly choose the correct item as it appears. Be aware that the items change order, so pay attention! Fashion Designer: Collect the number of items needed before time runs out! A Button: Choose what you want. B Button: Select item. C Button: Go to different screen. Bank: Catch the falling Gotchi points with your bag. Try to avoid the skulls. If you get to 100, you win! Cook: A picture will be shown of one out of three items. A hButton: First item. B Button: Second item. C Button: Third item. Quickly choose the correct item as it appears. Be aware that the items change order, so pay attention! Rock Star: An arrow will come from the top of the screen to the bottom. When the falling arrow is aligned with the arrow at the bottom, press the corresponding button. Baker: A picture will appear on the screen. When an item that matches the picture moves under the claw, press the B button to grab it. Timing: Make sure to press B a little before it goes under the claw. Travel Guide: Press and hold A to go up, and C to go down to dodge the flowers. Your bus will go faster if you don't crash. You can also press the B button to go faster. 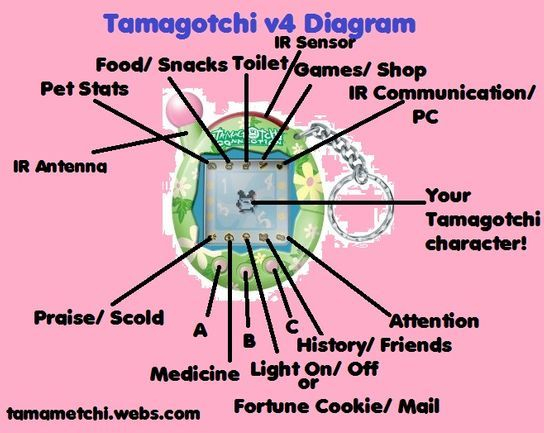 Firefighter: Your tamagotchi will be sitting in a firetruck. The truck moves on its own. Press B to put out the fire when you are lined up with the plus sign on the house on fire. Hairdresser: A tamagotchi will appear in front of you. Then arrows will appear on the screen. A Button: < C Button: >. Press the buttons in the correct sequence quickly. You must do it quickly and correctly or else you will lose the game. Florist: A picture will appear on the screen. When an item that matches the picture moves under the claw, press the B button to grab it. Timing: Make sure to press B a little before it goes under the claw. Balloon Catcher: Move you tamagotchi with the A Button and C Button. When the balloons are low enough, use the B Button to jump and catch the balloon. You need to catch a specific number of ballons before time runs out, so be quick about it! Bus Counter: Pay attention to how many toddlers get on the bus. Add one if a toddler comes on and subtract one if a toddler goes off. Then you will be asked how many toddlers are on the bus. Scroll through the numbers using the A Button to go up a number and the C Button to go down a number. Press the B Button to submit. If you get it right, toddlers will continue to come on or go off the bus. You must add or subtract to the last number (don't start from zero.) If you pass three times in a row, you go to the next level and then you start off from zero. Firefighter: Use the B Button to put out the fire. Dancer: Use the B Button to stop the symbol on the target. Kindergarten/ Bus Counter: See how many toddlers go on the bus. Use the A Button and B Button to submit your answer. Rockstar/ TV: Match the items when they get on the arrows with the A Button, B Button, and C Button. Weightlifter: Repeatedly press the B Button to lift the weight. School: Match the selected item with the six choices below. Be aware of the timer. Press the A Button to scroll through the items, and press the B Button to select it. Use the C Button to un-choose the item if you need to. Hospital/ Bank: A Button: Left C Button: Right Avoid the skulls and poop. Circus: Use the B Button to jump higher. Use the A Button to grab the balloons on the left, and the C Button to grab the balloons on the right.